James Jebusa Shannon, like his contemporary John Singer Sargent (1856–1925), had great success as a portraitist in England, where he was knighted for his achievements in 1922. “His work is admirable, broad and sure, full of beauty and of character,” Samuel Isham wrote, “but there is little in it that betrays the American” (The History of American Painting [1905; 1915], p. 427). The son of Irish immigrants, Shannon was born in Mount Auburn, New York. He was eight when his family moved to Canada and settled in Saint Catharines, Ontario, where he received his first training from a local painter named Wright. It was on his teacher’s advice that he continued his studies in London, where in 1878 he entered the South Kensington School (now the Royal College of Art). Encouraged by his instructor, the successful academician Sir Edward John Poynter, Shannon studied there for three years, supporting himself with money he earned painting portraits. At the age of nineteen, he was commissioned to paint a portrait of one of the queen’s maids of honor, the Hon. Horatia Stopford (untraced). This painting was well received at the Royal Academy exhibition in 1881, and by the late 1880s Shannon’s reputation was established. With such artists as James Abbott McNeill Whistler (1834–1903) and George Clausen (1852–1944), Shannon was a founding member in 1886 of the New English Art Club. There the exhibitions were organized that helped spread the influence of modern French painting in England. Shannon continued to paint portraits, but he also did many figure paintings, often using his wife, and daughter Kitty (1887–1974), as models. Described as “subject pieces,” these were exhibited in his first one-man show at the Fine Art Society in London in 1896. The two paintings in the Metropolitan Museum of Art, Jungle Tales, 1895, and Magnolia, 1899, decorative in treatment with colorful patterns and elaborately costumed figures, exemplify the new direction Shannon’s work took in these years. Although his style is not unusual in Victorian English painting, it seems to have developed under the influence of George Hitchcock (1850–1913) and Gar Melchers (1860–1932), with whom he often painted at Egmond, a popular artists’ colony in Holland. Several of his works from the turn of the century appear to be set in Egmond; for example, George Hitchcock, ca. 1897 (Telfair Academy of Arts and Sciences, Savannah) and The Flower Girl, 1900 (Tate Gallery, London). The Flower Girl, which won the Chantrey Prize in 1901, has the maternal subject matter, decorative patterns, and roughened paint surface often associated with the paintings of Melchers. Shannon became an associate member of the Royal Academy in London in 1897; he won medals and prizes at the Carnegie International Exhibition in 1897, the Pennsylvania Academy of Fine Arts in 1899, and the Pan-American Exposition in 1901. After 1900 he paid several visits with his family to the United States. Accepting a number of portrait commissions, he worked mostly in New York, where in 1905 he shared a studio with Frank Millet (1848–1912). Among the Americans Shannon painted, according to his daughter, were “Mrs. Rockefeller, Mrs. Untermeyer, Mrs. Sears and her two daughters…and Mrs. Mellon” (K. Shannon, For my Children [1933[, p. 188). His portrait of Catherine Marshall Gardiner, 1908 (Lauren Rogers Library and Museum of Art, Laurel, Mississippi), however, is one of his few late portraits in an American public collection. He was elected an associate of the National Academy of Design in New York in 1907. Shannon continued to enjoy success in London, where he became an academician at the Royal Academy in 1909. He belonged to the Chelsea Arts Club, the Royal Hibernian Academy, the Royal British Colonial Society of America, and served as president of the Society of Portrait Painters. Around 1914 he was injured in a fall from a horse, and thereafter he spent much of his time on a farm in Kent. He continued, however, to paint until his death. 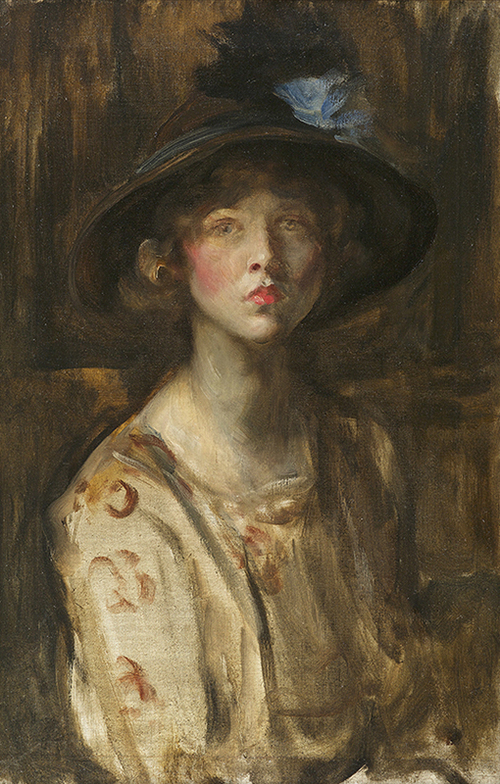 Memorial exhibitions of Shannon’s work were held at the Leicester Galleries in London in 1923 and in 1924 at the Columbus Gallery of Fine Arts in Ohio and the Buffalo Fine Arts Academy, Albright Art Gallery. Many of the artist’s works, such as his nudes, elaborate Victorian interiors, and his more imaginative portraits are not very well known today. Indeed, little has been written about Shannon or the development of his style. 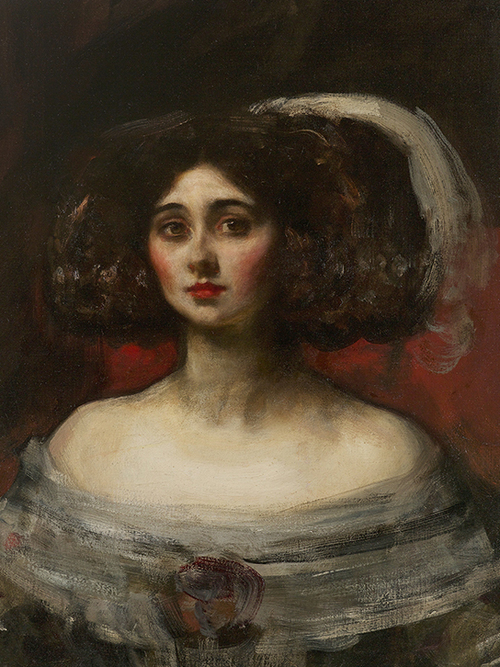 Please contact us if you are interested in selling your Sir James Jebusa Shannon paintings or other artwork from the 19th century and early 20th century.